"Buz" is the Dari word for "goat." 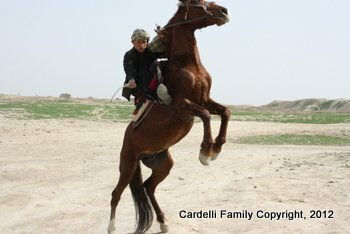 Buzkashi translated literally from Dari means "goat grabbing." A wild form of rugby on horseback, where the goal is to get the water-soaked, headless goat from one side of the field to the designated winning spot on the other. The buz is soaked in water beforehand to toughen it up. It's placed in a chalked out circle on the ground. At a signal, the two teams try to grab the buz and get it to another chalked out circle on the opposite side of the playing field. The winner is the one who gets the (largest piece) buz there first. Flying hooves, fierce whips, shoving, grabbing, and the melee of gorgeous Arabian horses results in tough sport only master players (chapandazan) may win. It is a dangerous game. Before he was killed by Pakistani surgents, master digital cinematographer Brian Carderelli produced the following video of Buzkashi he had the opportunity to film in 2009. (See his other videos here). Joseph Kessel, the author of The Horseman, is one of the few authors to describe the game in the first half of modern Afghanistan....before the nation fell into war. While Buzkashi looks out of control, it actually has a few fixed rules and a long history of tradition. "Buzkashi demands the highest degree of horsemanship, courage, physical strength, and competitive spirit from its participants" (Afghan Embassy). The largest contests are played on the Daht-i-Shadian (Desert of Happiness) near Mazar-i-Sharif and in the Kunduz Stadium. Games are played outside of Kabul as well. Typically, these occur in the winter and early spring, when the ground is hard and it is not too hot to play. a good rider on a poor horse"
is an Afghan proverb heard at every Buzkashi contest. The horses are of special breeds not found elsewhere in the horse world. Need another tea break - I'll be back later to finish this page.